An interview with the champion of Europe in the weight category up to 55kg, Ludivine Vedapodagom. We talked to the champion after the tournament and asked her to tell us about her victory in this tournament. 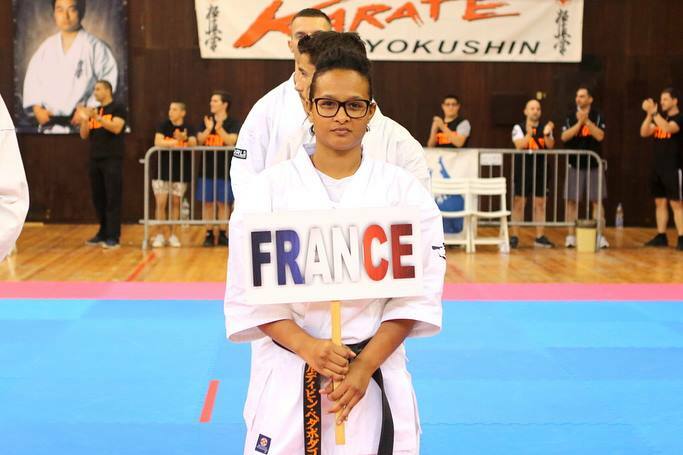 Ludivine, we would like to congratulate you on you Victory at the European Championship! I come from Reunion Island situated in the Indian Ocean. 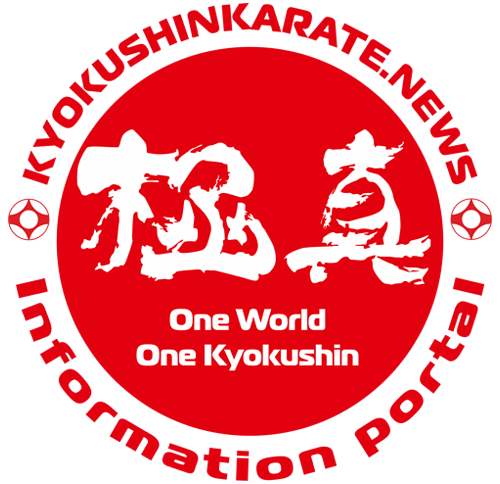 It’s been more than 16 year that I’m practicing Kyokushinkai Karate, and it was my father who inspired me to. He is my coach. I’ve started Karate when I was 3, and the competitions when I was 5. Before I started competing in adult division I have taken part in National Competitions in France, International Tournaments in Poland, Africa and Japan. Since last year, my coach and me we have decided to take part in maximum of tournaments, so that I could progress. That’s why I was present at all the Tournaments. This year’s season has started in November when I won the 1st place and Best Spirit Trophy in British Open. 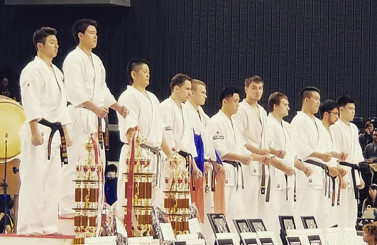 In January, I have taken part in US Weight Category in Los Angeles, where I’ve taken the gold medal and Best Technique Trophy. In march, I’ve been to Spanish Open in Barcelona, I have on in my category and I’ve got the Best Spirit Trophy. And just before the European Championship I went to Japan to the World Championship. Unfortunately I lost. I lost against a Russian fighter after 2 intense fights. But I’ve taken a lesson from this defeat, to change some things for the European Championship, and it worked! Last year it was your first time at European Championship. If you compare both, which one was more difficult? Yes, last year it was my first European Championship in adults. I was also taking part in team kata (where our got the 3rd place). As I had to cope with both, this championship had been more difficult for me. I was concentrated at team KATA. What fight was the most difficult for you? 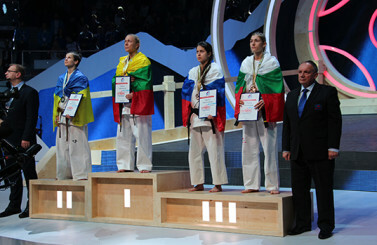 For me the most difficult fight was the semi-final with the Russian champion Iaroslava Moreva. I respect her a lot. 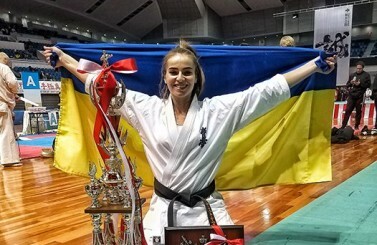 She has great technique and she won a lot of championships, also a World one. During the fight I was listening to my coach, and thanks to the new rules I could sweep her and it gave me waza-ari. SO I won. Did you expect this result for you 2nd time at the European Championship? I have been training non-stop to reach this goal. After losing the World Championship, My Coach and me we promised ourselves to win the European Championship. Done. At the end of your final fight you were almost crying, what emotions were you experiencing at this moment? What were you thinking about? Once I did my mawashi jodan during the last seconds of the fight, I told myself “I did it”. When I heard “Ludivine Vedapodagom- European Champion” I was thrilled. I made a lot fo sacrifice to come to this result, hours and hours of daily training. It’s not easy to train hard every day. There were days when I cried. But this result made me think that it was worth it. What is the secret of your success this year? True I the fact that taking part in various tournaments helped me a lot to fights against stress, to manage the fights. But the only secret it to train hard. Will you take part at this Championship next year, to show that it wasn’t a random victory? I don’t know yet. Nothing is decided yet. I’m trying to concentrate on this year. What did your coach tell you after the final? After the final fight, my coach congratulated me and told me he was proud of me. Were you looking after other fighters? Who was your favorite fighter and why? I was looking after the performance of my favorite woman fighter Anastasia Khripunova. I admire her sports, path with a lot of European and World victories. She has a large collection of different victories, in middle and heavy weight, she’s extraordinary. How was this Championship for you, and what will you remember about it? This championship was very enriching and emotive for me. The organization was on a very high level. The fights were beautiful, and the atmosphere was very friendly, either among the organizers or among the participants. Why do the girls choose such sports? What attracts you in fights? Some girls like fights as they allow them to protect themselves, other practice karate because they like it. In kumite I like the adrenaline that one can feel once going on the tatami. When we start the kumite we are very concentrated. I love the fact that my coach is near me, and that I can reproduce all the things he says. How were you welcomed home? When I came back home, all of my family and also my training partners welcomed me at the airport with posters and music. I was very touched and I cried (again)! They welcomed us with our traditional rhythms and we danced to celebrate my victory. What is your next championship? It’s All American Open that takes place in New York on the 23rd of June. We wish you good luck and hope to see you on the European Championship in Poland.